Beto O'Rourke was a Democratic member of the U.S. House from 2013 to 2019, representing Texas' 16th Congressional District. O'Rourke also served on the El Paso City Council from 2005 to 2011. 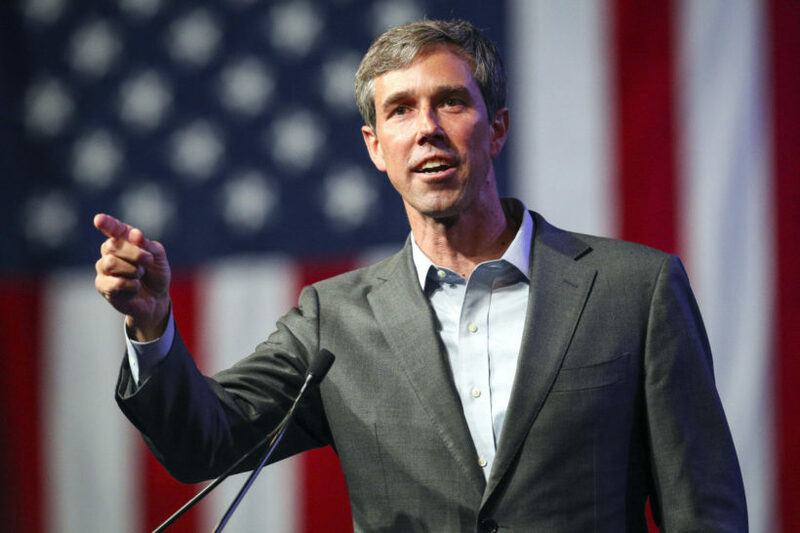 On March 14, O’Rourke announced his candidacy for Democratic candidate in the 2020 presidential race. 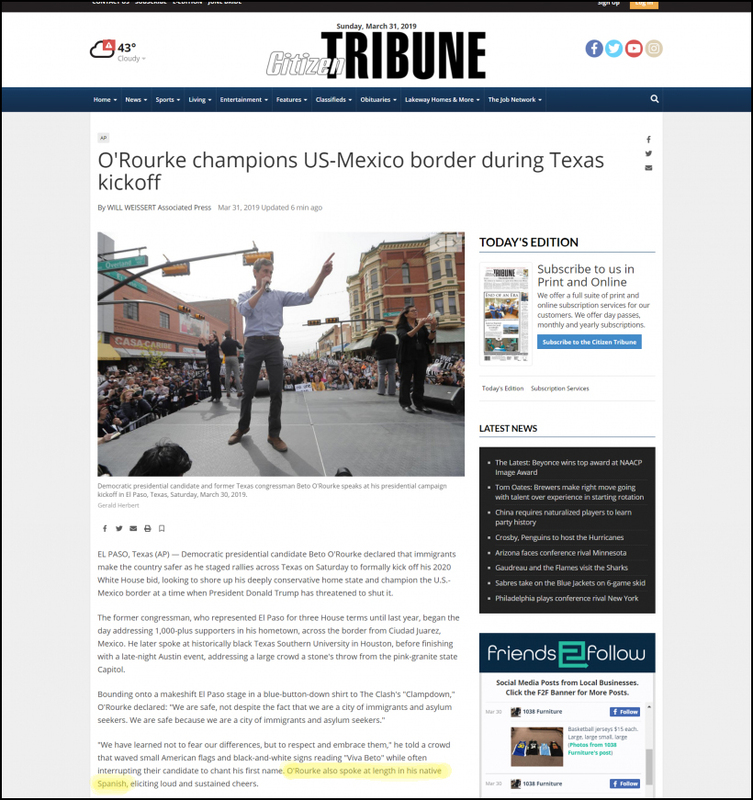 In coverage of Beto (Robert Francis) O’Rourke’s official kickoff of his 2020 presidential bid on Sunday, the Associated Press furthered the false narrative that he’s Hispanic when it declared that he spoke to the El Paso, Texas, crowd in “his native Spanish.” He is, in fact, a fourth-generation Irish-American. He grew up in the Texas border town of El Paso. He speaks fluent Spanish. “We have learned not to fear our differences, but to respect and embrace them,” he told a crowd that waved small American flags and black-and-white signs reading “Viva Beto” while often interrupting their candidate to chant his first name. Mr. O’Rourke also spoke at length in his native Spanish, eliciting loud and sustained cheers. The post above was compiled from articles at The Daily Beast, Media Research, Townhall and the Citizen Tribune. A news agency (also known as a wire service or newswire) is an organization of journalists established to supply (sell) news reports to news organizations from around the world. The major news agencies (AP, Reuters, AFP) generally prepare hard news stories and feature articles that can be used by other news organizations with little or no modification, and then sell them to other news organizations. The AP – Associated Press is the most used news agency in the U.S. Many news articles published by U.S. news outlets are AP stories. Robert Francis O’Rourke was born in El Paso, Texas to Pat Francis O’Rourke and Melissa Martha O’Rourke (Williams). He has Irish and Welsh ancestry. Wikipedia reports: His family gave Robert the nickname “Beto,” a common Spanish nickname for first names ending in “-berto” to distinguish him from his namesake grandfather. 1. The AP falsely reported that Democratic presidential candidate Robert Francis O’Rourke (Beto) was “speaking in his native Spanish,” leading readers to believe he is Hispanic. He is not. Do you think the Associated Press reporters intentionally mislead readers about Mr. O’Rourke? Explain your answers. 2. If intentional, what type of bias does the AP display by misrepresenting Beto O’Rourke’s heritage? 3. What positive or negative impact would misleading potential voters (printing a false narrative) about Mr. O’Rourke’s heritage have on his candidacy? 2. Falsely representing Democratic presidential candidate Beto O’Rourke’s heritage as Hispanic is bias by spin. 3. Misleading voters would have a positive impact on Beto O’Rourke’s candidacy, as some think Hispanic voters would vote for Beto because they believe he is Hispanic.